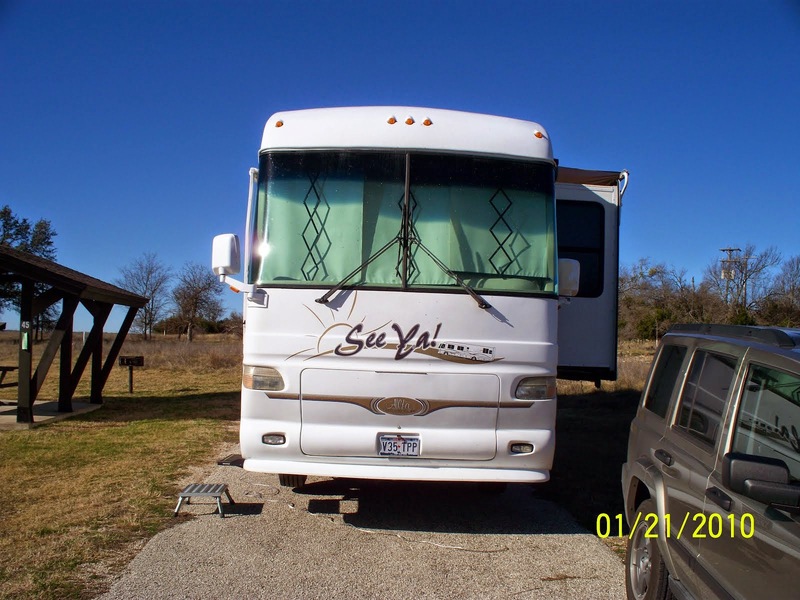 I mentioned in my last post that we stayed a couple of days at the Sunny Acres RV Park in Las Cruces, New Mexico in November 2003. Since my last post was about a fast trip from Twentynine Palms, California to Dickinson, Texas, I did not take enough time to do justice to some of the areas we passed through. Las Cruces is one of them. Las Cruces translates to “City of the Crosses”. The city deserves a lot more attention than I gave it last time. Population is about 100,000 people and it is the county seat of Dona Ana County. Las Cruces is a very well kept city with a lot of beautiful adobe homes with mountains in the backdrop. We have returned to Las Cruces many times since that first visit and it is a pleasure every time. A mountain view on the outskirts of Las Cruces. 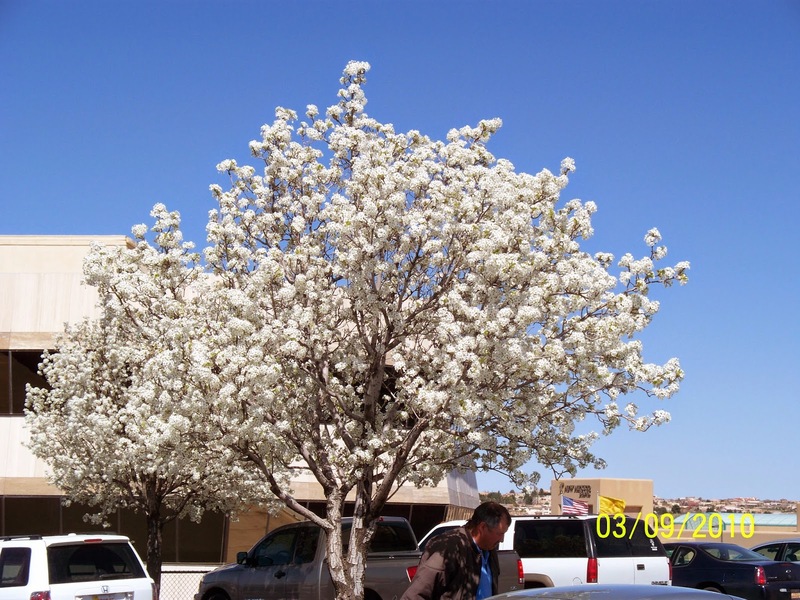 Beautiful tree with white blooms in Las Cruces. There are many restaurants in town but our favorite Mexican cuisine is at Pepe’s at the intersection of North Valley Drive and West Picacho Avenue. 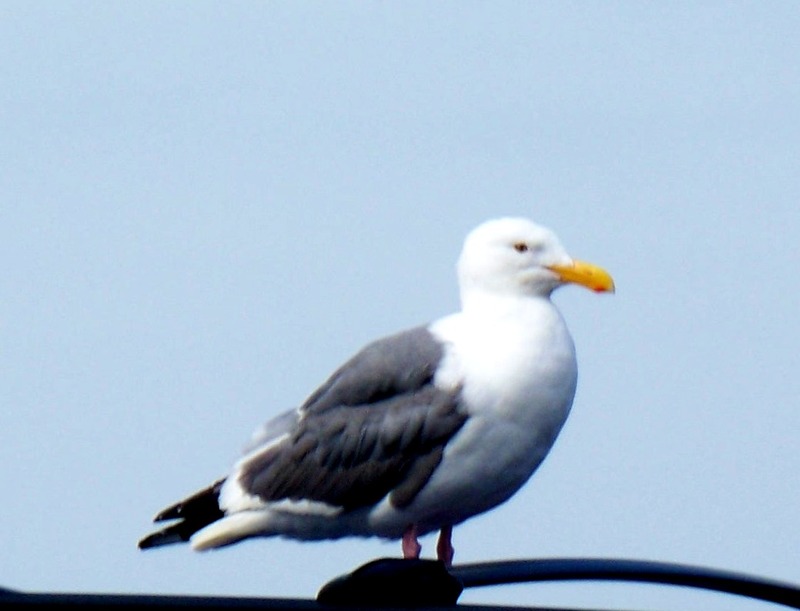 It is about ¼ mile from Sunny Acres RV Park. The cheese enchiladas are good, but I prefer the quesadillas. On the south side of town is Mesilla Old Town that is a historic Mexican Village. Population is about 2,000. The adobe homes are small and the streets are narrow, normally only wide enough for one car. It is fun to drive through and look at the architecture, surrounded by the beautiful mountains. Mexican restaurants surround the town square and I remember a barbecue restaurant in the area. We prefer the restaurants in Las Cruces to the ones in Mesilla, but our thinking is probably price driven. I thought the prices were high compared to the same quality of food available in Las Cruces. Mesilla also has hotels and bed and breakfasts available for tourist’s enjoyment. 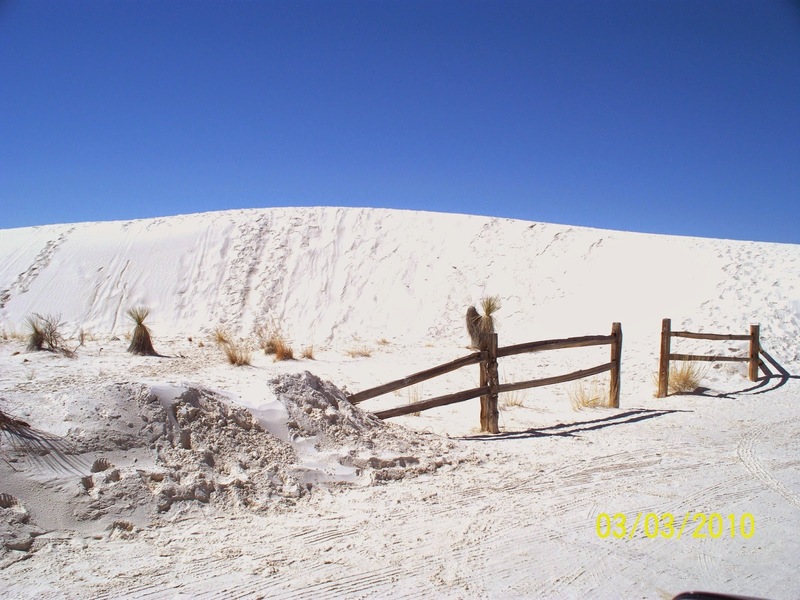 Las Cruces is a good home base to visit the White Sands National Park. Leave Las Cruces going north on I-25 and turn east on US 70 across the San Andres Mountains and you are in the desert near the Holloman Air Force Base. 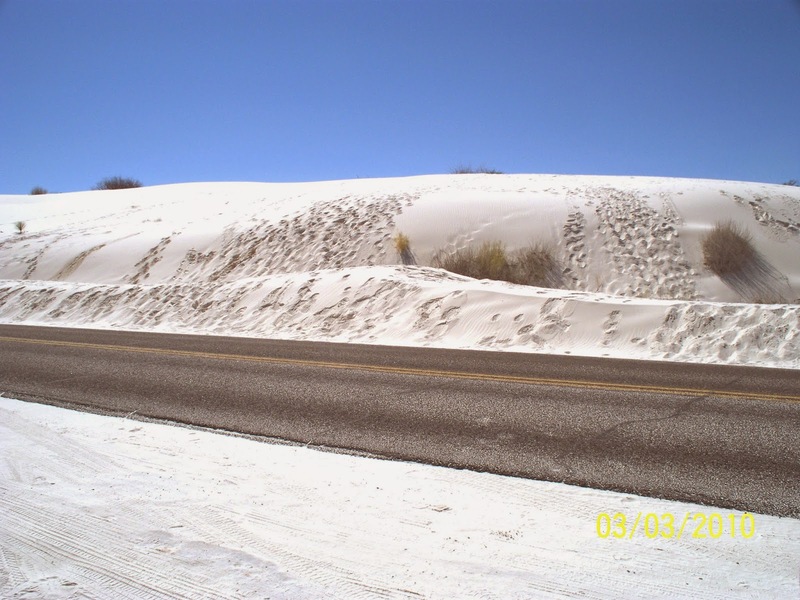 The military uses the White Sands Missile Range to test weapons. When weapons are being tested the park and park road access is closed to the public. 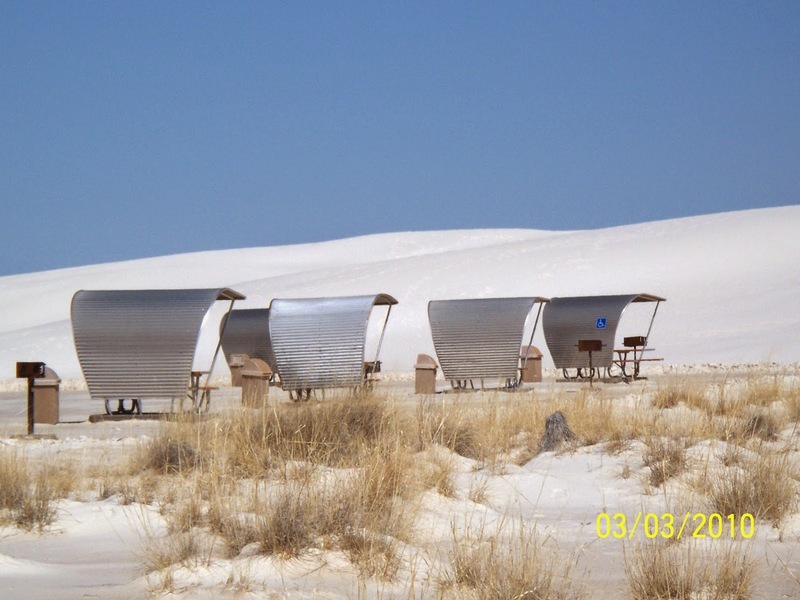 The White Sands National Park is about 10 miles southeast of Alamogordo, New Mexico. Notice footprints in the sand. The wind erases them overnight. An old fence that seems to have no purpose. 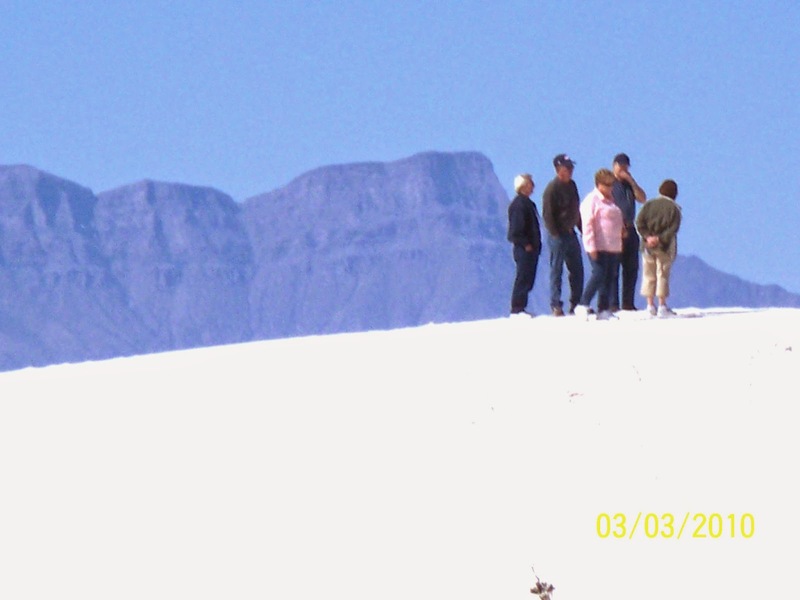 People seem to be fascinated by climbing the dunes. I like seeing the little ones climb the dunes. We enjoyed driving through the park, but every time we have been there it has been an overcast day, so not perfect for pictures. 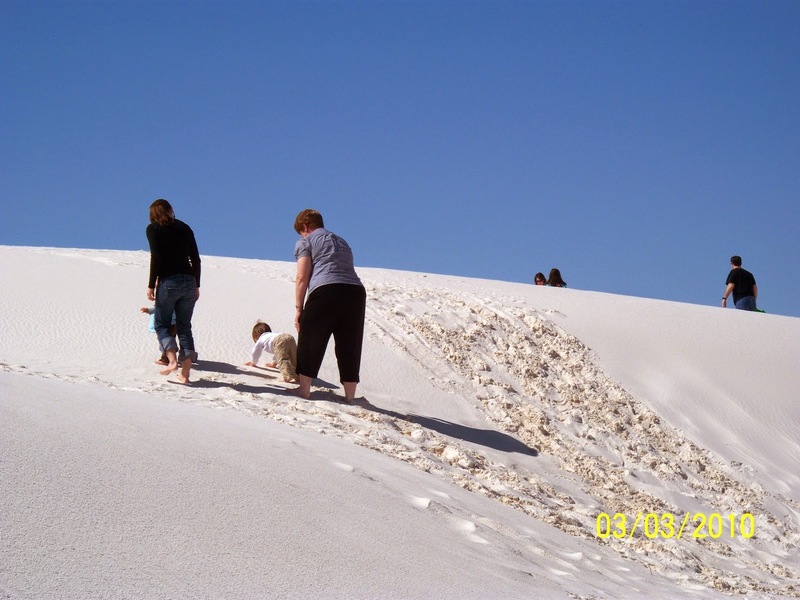 It is still worth the opportunity to view the pure white sand dunes and surrounding areas. 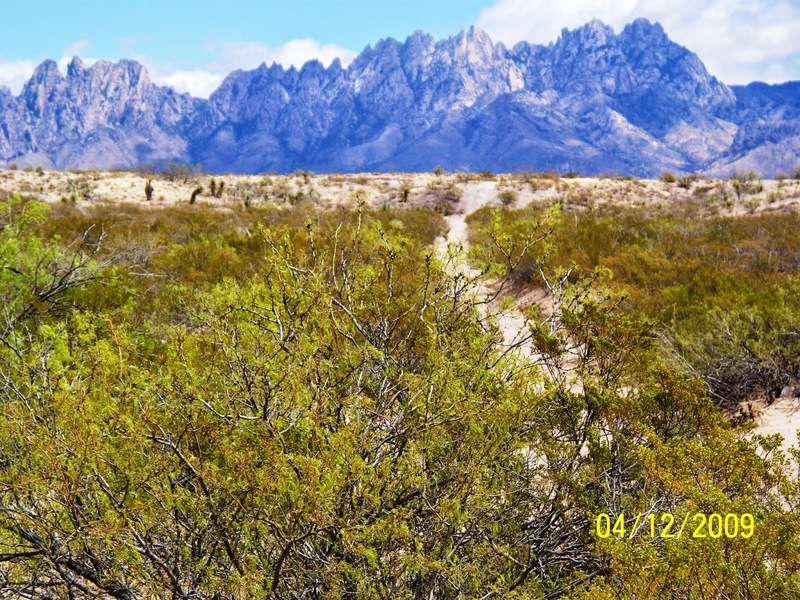 We have also used Las Cruces as a home base for a drive east to Carlsbad Caverns, about 100 miles away. We went down the elevator shaft to the caverns and I took many flash pictures and almost none of them came out. You need a lot more light to capture the beauty and enormity of the caverns. After walking about an hour, both Kathi and I were tired and headed back to the elevator. It felt like a longer walk on the return than it did during the leisurely stroll viewing the sites going into the cavern. An interesting thing we found out is that they had to move the parking lot from over the top of the caverns because it diverted water seeping through the rock which curtailed growth of stalactites and stalagmites. People have a lot of impact on our world.